Changing hormone levels, a decrease in activity and loss of muscle all make it more difficult for women in their mid-forties to lose weight. Low-carb diets are effective at helping 45-year-old women lose weight quickly. However, before you ditch all your bread and pasta, consult your doctor to discuss the benefits and risks of a low-carb diet for you. Any diet can help you lose weight, but a low-carb diet has been shown to help women lose weight faster than low-fat diets, according to a 2007 clinical study published in JAMA. This 12-month study compared the effects of some of the most popular weight loss diets, including Atkins, Zone, Ornish and the LEARN diet, on weight loss in a group of overweight and obese premenopausal women ranging in ages from 25 to 50. The researchers found that not only did the women lose more weight on Atkins, the low-carb diet, but they also shed more body fat; improved HDL, the good cholesterol; and lowered triglyceride levels. One of the reasons the low-carb diet might work so well for women is because it helps keep hunger under control, according to a 2005 study published in the Journal of the American Dietetic Association. This study, which included only premenopausal women, found that women weren't as hungry on a low-carb diet as a high-carb diet. This may be because protein foods are better at controlling hunger than carbs or fat. There's no low-carb diet guide, but most plans start you off on a very low-carb diet, and add carbs after you lose weight. On the Atkins plan, the women in the JAMA study were restricted to 20 grams of carbs a day for the first two to three months, then increased to 50 grams. However, carbs on a low-carb diet can range from 20 to 150 grams a day, according to a 2008 article published in the American Journal of Clinical Nutrition. Your doctor or dietitian can help you determine the amount of carbs you should eat each day to help you lose weight. 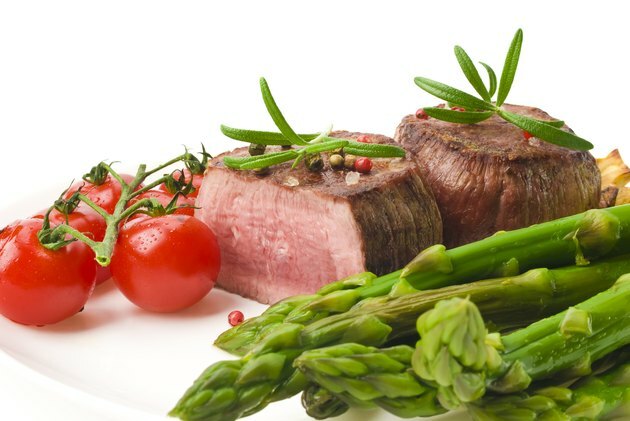 To keep carbs low, you'll be eating mostly carb-free proteins such as beef, pork, chicken, turkey, eggs and seafood. Cheese is also rich in protein, but most types have about 1 gram of carb per ounce. Fiber is important for women in their 40s because it protects against heart disease and cancer. A low-carb diet makes it difficult for you to get the recommended 25 grams a day, which is why it's necessary to include plenty of non-starchy veggies on your plan. This includes alfalfa sprouts, asparagus, spinach, bok choy, kale, broccoli, cauliflower, mushrooms, cucumbers, lettuce and onions. These veggies each have 5 grams of net carbs or less per serving. Fiber doesn't affect blood sugar, so it's not included in the carb count. "Net carbs" refers to the carb content in foods after you subtract the fiber. Fruits are also high in fiber, but many are too high in carbs to fit a low-carb plan. However, pumpkin, olives and avocados each have less than 5 grams of net carbs per serving. Soy foods, including tempeh, tofu and edamame, are also low in net carbs, with 3 to 6 grams per serving, and as a source of protein, they serve as a meat alternative. Though soy foods are good for your heart, if you have a history of breast cancer, talk to your doctor about whether it's OK for you to include more soy in your diet. And finally, round out your meals with carb-free fats such as butter, olive oil, sesame oil or soy oil and low-carb salad dressings such as Caesar or ranch. If you're on 30 grams of carbs a day, for breakfast you might have a crustless frittata made with eggs, Swiss cheese and chopped asparagus and onions; serve it with bacon or cooked ham. Or try two low-carb pancakes made with low-carb baking mix topped with 1/4 cup of sliced strawberries. Cubed tofu stir-fried with broccoli, bok choy, mung bean sprouts, sesame oil and soy sauce makes a delicious low-carb lunch. You might also consider mixed greens topped with sliced chicken, sliced hard-cooked eggs, cucumbers, crumbled bacon and ranch dressing for lunch. Finish the day with broiled salmon with roasted brussels sprouts and turnips. A bunless burger topped with cheddar cheese, lettuce and tomato also makes a good dinner. Serve with fresh green beans sauteed in olive oil and garlic. Low-carb snack options include chunks of cheese, hard-cooked eggs, rolled carb-free deli meats, celery sticks, olives or sliced cucumbers. Some deli meats contain added sugar, such as honey ham, so be sure to read the label. If you have a few carbs to spare, throw in a handful of fiber-rich nuts every once in a while. An ounce of pecans, hazelnuts or almonds has 1 to 3 grams of net carbs each.